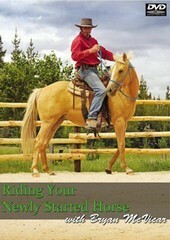 This DVD is a must for anyone with a newly started [broken in] horse Or simply anyone who wishes to have a better understanding of how to get along with and ride their horse. The DVD details Catching, saddling ,groundwork, safety checks and riding -includes 5 rein positions and how to perform a panic stop. Professionally filmed and directed to a high quality with a tremendous amount of useful information delivered in Bryans easy to understand ,no nonsense manner. Approx 48 mins running time.